WebSphere Commerce Suite V 4.1 is the latest offering in support of e-commerce for OS/390. It is a flexible, scalable, secure application suite that makes it easy to produce functionality for net-based commerce solutions. 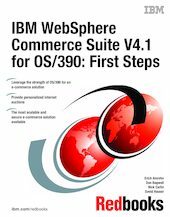 This IBM Redbooks publication describes the architecture and features of WebSphere Commerce Suite, as well as presenting a review of the features carried forward from the predecessor product, Net.Commerce V3.1.2 for OS/390. This book helps you plan for, install, configure, and tailor WebSphere Commerce Suite for OS/390. Detailed instructions for migrating from Net.Commerce to WebSphere Commerce Suite are provided. Step-by-step examples of creating and publishing a Web-based store, creating a customized on-line auction, and designing personalized pages are also presented.